A performance of music or dancing that is typically intended for the public: Lana decided to buy a balcony ticket in order to attend the concert on the weekend. To maintain an association with an individual or group: Kenny was pleased when he realized that his daughter liked to consort with the musicians who often put on concerts in the park. Rudy has indicated that he wants to consort with other writers. 1. A spouse, typically thought of as regal: The Prince Consort often accompanied the queen during her travels. 2. A ship accompanying another in travel: As the oil ship was traveling through the dangerous piracy area, there was a consort which was prepared to protect the bigger one. The queen and her consort decided to attend a concert in a foreign country to which they would travel by ship accompanied by a consort which carried all of their luggage. To keep company or to associate with others: Susan likes to consort with her friends when they meet every Saturday for coffee and cake in the afternoon. © ALL rights are reserved. 1. An association or grouping of institutions, businesses, or financial organizations, usually set up for a common purpose that would be beyond the capabilities of a single member of the group. 2. An association or a combination, as of businesses, financial institutions, or investors, for the purpose of engaging in a joint venture. 3. A cooperative arrangement among groups or institutions. 4. 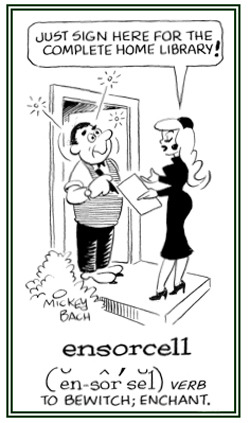 The right of a husband or wife to the company, affection, and help of, and sexual relations with, his or her spouse. To enchant or to bewitch someone: The entertainer ensorcelled his audience with his extraordinary magical presentations and personality. © ALL rights are reserved. 1. One's fortune in life; fate. 2. An object used to make a determination or choice at random: "casting lots." 3. 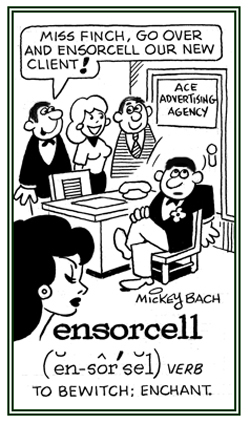 The use of objects in making a determination or choice at random: "chosen by lot." 4. Something that befalls one because of or as if because of determination by lot. 5. Etymology: from Old English hlot, "object (anything from dice to straw, but often a chip of wood with a name inscribed on it) used to determine someone's share"; also, "what falls to a person by lot". An object was placed with others in a receptacle, which was shaken, the winner being the one that fell out first; hence, to cast lots. In some cases the lots were drawn by hand. The sense of "plot of land" is first recorded in 1633 (distribution of the best property in new settlements often determined by casting lot), that of "group, collection" is 1725, from the notion of auction lots. The generalized sense of "many" is first attested in 1812. To cast (one's) lot with another is to agree to share the winnings of something. 1. 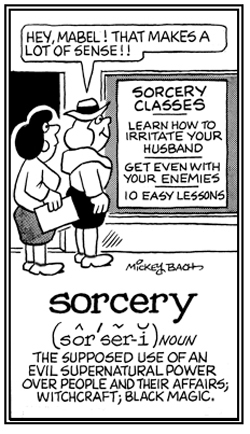 Someone who is believed to have magical powers or who claims to have magical powers: In the past, sorcerers were considered either evil, and were often put to death; or they were revered by nobility, because the high ranking royals believed that the sorcerers could ward off evil through spells. The people in the village thought the old man who lived alone in the forest was a sorcerer and that he was able to conjure up evil spirits to torment them if they mistreated him; so, they treated him with respect. 2. Etymology: from the Latin sortiarius, usually someone who "casts lots" which are used to determine the fate or destiny of certain people. © ALL rights are reserved. 1. To transform or to change by means of magical powers. 2. 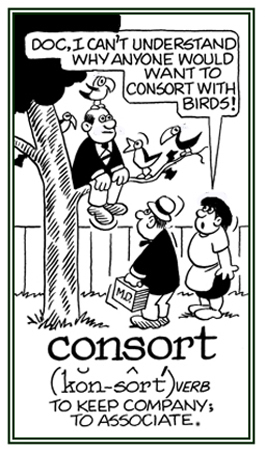 Etymology: from Old French sortir, "allot, sort, assort", from Latin sortiri, "draw lots, divide, choose", from sors which is a shortened form of "assort". 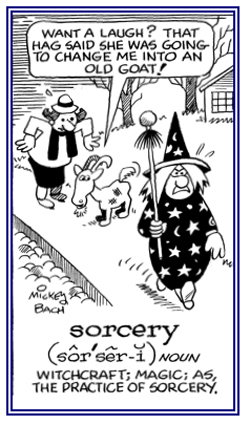 Of the nature of or descriptive of magical powers: "The sorcerous elements include: enchantment, witchcraft; the use of supposed supernatural powers by the agency of evil spirits called forth by spells, incantations, etc., on the part of the magician or witch." 1. The use of supernatural powers with the assistance of evil spirits usually in order to harm other people: When Mark found out that his wife was having an affair with another man, he paid a woman who was a specialist in sorcery, to make his wife's new boy friend fall in love with another woman and not have anything to do with his married partner anymore. 2. 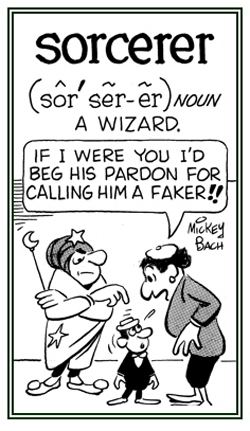 Etymology: from Old French sorcerie, from sorcier, "sorcerer", from Vulgar Latin sortiarius; literally, "someone who influences fate or fortune", from Latin sors, "lot, fate, fortune". 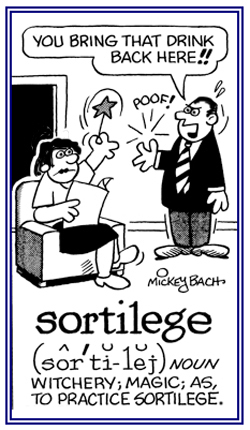 Sort (noun) from Old French sorte "class, kind", from Latin sortem, "lot, fate, share, portion, rank, category". The sense that evolved in Vulgar Latin is from "what is allotted to one by fate," to "fortune, condition", to "rank, class, order". 1. 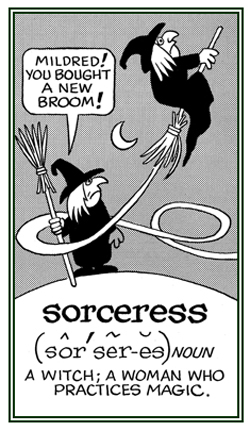 The practice of magic with supernatural powers: With the wave of her magical wand, the Fairy Godmother, skilled in sortilege, changed the poor little scullery maid into a beautiful princess. 2. 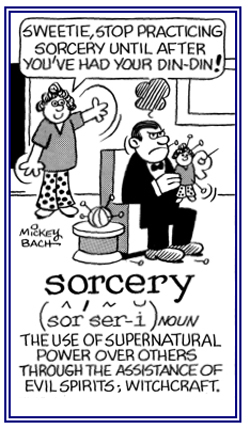 Etymology: from Latin sortilegus, “prophetic, soothsayer”; from sors, “lot, fortune” plus legere, “to read”. © ALL rights are reserved. Cross references of word families that are related directly, or indirectly, to: "divination, diviner; seer, soothsayer, prophecy, prophesy, prophet": augur-; auspic-; fa-, fate; Fates in action; futur-; -mancy; omen; -phemia; vati-. A cross reference of other word family units that are related directly, or indirectly, to: "chance, luck, fate": aleato-; auspic-; cad-; fortu-; -mancy; serendipity; temer-; tycho-.